Ross Johnson of Morattico (above) is a member of a neighborhood volunteer group that conducts a regular trash pickup on and near Morattico Road. 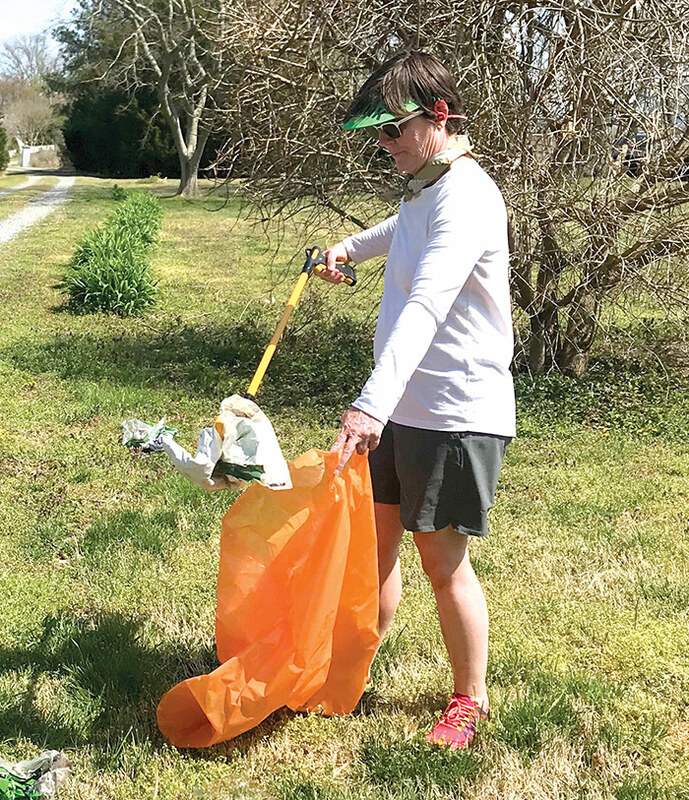 She has noticed a recent increase in litter along Lancaster County roads and plans to participate in the county-wide cleanup on April 27. • Volunteer to pick up trash on the countywide cleanup day, April 27. • Organize a group and sign up for the Virginia Department of Transportation Adopt-a-Highway program. Call VDOT’s Adopt-A-Highway Coordinator for the Northern Neck, Stacy Messenger, at 333-3696. Report an increase in litter along a particular stretch of road to Messenger, and she may be able to list the road as “most in need” for adoption. Along the winding ribbons of highway that span the Northern Neck, the quiet lanes that lead to water views and dirt roads lined by green fields is a blight that mars the landscape. Plastic shopping bags blow around in the wake of passing cars and dirty fast food wrappers, cups, bottles and cans lie in wet ditches. “It’s disgusting and it’s getting worse and worse, and we have to do something about it.” That’s the sentiment of Ross Johnson of Morattico and many other county residents who have been appealing to county leaders to help clean up the litter along roadsides. “The Northern Neck is beautiful and now, to drive along these roads, it’s just depressing,” said Johnson. Groups like the Virginia Department of Transportation’s (VDOT) Adopt-a-Highway teams have taken it upon themselves to pick up litter. VDOT provides bags, safety vests and signage for pickup days, and they return to pick up the full bags. Recently, Johnson said she spent three hours picking up three garbage bags of trash on Morattico Road and she only covered a quarter of a mile. As a member of the Morattico Volunteers, she and others in the group will continue their efforts throughout the year. Litter is also picked up by VDOT workers who sometimes partner with inmates from the Virginia Department of Corrections. They schedule cleanup days prior to mowing primary and secondary roads. A round of road cleanups started in Lancaster and Northumberland on March 12. At the Lancaster board of supervisors meeting on March 28, two Irvington residents, Kurt Muse and Bruce Julian, spoke at length about the litter problem. Muse said he believes that county residents have developed a blind spot when it comes to noticing litter on the road because they see it so often that it blends in with the landscape. “No one here has noticed that the trash by the road in this county is growing by leaps and bounds week-by-week,” he said. One solution would be to hire several full-time crews to pick up the litter, he suggested. “It’s a sad situation when residents, visitors and prospective homebuyers comment about how bad and trashy our county looks,” he said. Responding to the comments of Muse and Julian coupled with the general public outcry, supervisor Bill Lee suggested a countywide litter pickup. The supervisors voted unanimously, 5-0, to schedule the event on April 27. The county will supply bags to residents and will pick them up afterwards. Any level of participation is encouraged, even just picking up trash on one’s own property. 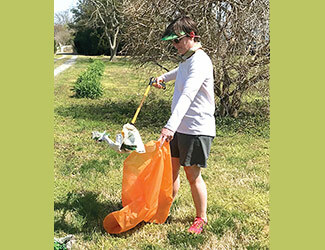 Keeping people from littering in the first place is key to solving the trash problem, said Ben Lewis of the Northern Neck Planning District Commission. Picking up trash is a temporary fix, he said. Within hours or days, litter reappears. Lewis knows this because he is on the county roads frequently as the litter control coordinator for the commission’s Assign-a-Highway program. He works with people convicted of non-violent misdemeanors to help them work off community service hours by picking up roadside trash. A full bag of garbage equals one hour of service. The only deterrents to littering, other than the consciences of residents, are laws and signage stating the laws. Citing the Code of Virginia and the Lancaster County Code of Ordinances, littering is illegal; “Any vehicle transporting litter on any public highway must have its load covered to prevent its contents from blowing, dropping or falling from such vehicle.” If convicted of either offense, the punishment is a $500 fine and/or 30 days in jail. Last September, new signage informing drivers of the county’s $500 fine for littering was installed at three entrances to Lancaster. According to county administrator Don Gill, more anti-litter signs are being installed on Merry Point, Devils Bottom, Christ Church, Weems and Pinckardsville roads. Two more will go up near the Kilmarnock refuse center off Irvington Road and on Regina Road near the animal shelter. Other localities around Virginia and beyond are facing the same challenge and coming up with new angles on fighting the problem. Tazewell County in southwest Virginia is trying cameras as a way to catch litterers in the act. Positioned on the roadsides, the cameras film the culprits and the police post the videos online for all to see. Strategies in use internationally include supersized artful trash cans placed on the landscape in Denmark, trash cans that look like they’re wearing uniforms in Germany, and a campaign that emphasizes the shame of littering—“littering says a lot about you”—in Toronto. In the Northern Neck, it may take a fresh idea generated through a student contest to catch the public’s attention, said Lee.